The next generation of our most popular card printer, the Javelin J200i is an economic , reliable solution for almost every card printing and encoding need. The latest Javelin card printer J200i prints both color and monochrome , and a flipper is available for dual-side printing. The Javelin J200i printer of new generation is relible,compact and easy-to-use, delivering outstanding performance at a great price. 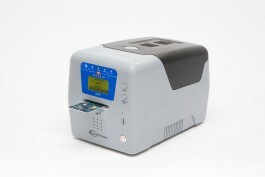 The J200i comes with a 2 year printer warranty !